To assess the association between oral mucosa hyperpigmentation in patients with leukemia and imatinib mesylate use. Additionally, we compared our data to those obtained from a systematic review. A cross-sectional study was conducted with 74 patients undergoing treatment with imatinib mesylate. Sociodemographic characteristics, oral mucosa alterations, and medical history were evaluated. Oral hyperpigmentation was scored. The use of imatinib mesylate and hydroxyurea was evaluated. Association between oral hyperpigmentation and imatinib mesylate was assessed. A systematic review was also conducted to retrieve case reports or case series of patients with oral hyperpigmentation associated with imatinib mesylate. Among the 74 participants, 41 were male (55.4%) and 33 were female (44.6%). Participants’ mean age was 49.3 years. Sixty-six (89.2%) patients developed hyperpigmented lesions in the hard palate mucosa. In multivariate analysis, patients who had used imatinib mesylate for > 72 months had a hyperpigmentation score 1.62 times higher than those who had used this medication during a shorter period. Patients who had used hydroxyurea for > 30 days had a hyperpigmentation score 1.43 times higher than those who had used this medication during a shorter period. 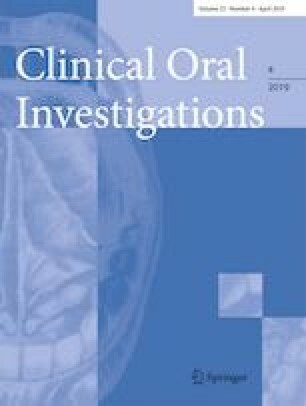 The systematic review retrieved 20 clinical cases of patients undergoing imatinib mesylate treatment and exhibiting oral hyperpigmentation. The development of oral hyperpigmentation is associated with imatinib mesylate use. Hydroxyurea seems to increment such an association. To assist providers in the differential diagnosis of hyperpigmented lesions associated with imatinib mesylate, as well as in the clinical management of such lesions. This work was supported by the Conselho Nacional de Desenvolvimento Científico e Tecnológico (CNPq) and the Coordenação de Aperfeiçoamento de Pessoal de Nível Superior (CAPES-Finance code 001). RAM and TAS are research fellows of CNPq.